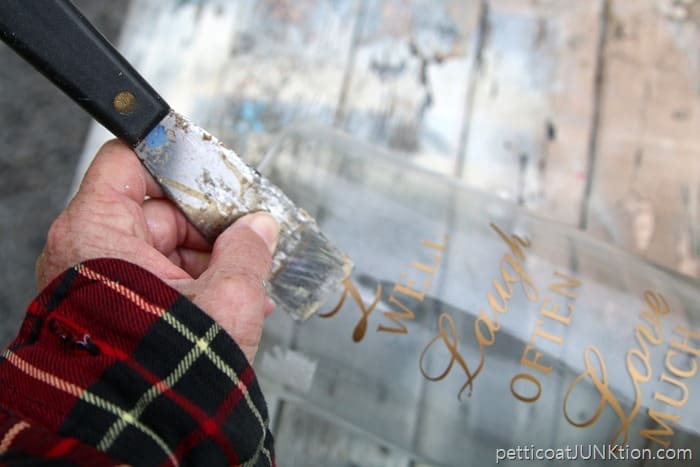 Did you know you can removing gold foil lettering from glass stuff is easy? I’ll show you just how easy it is. 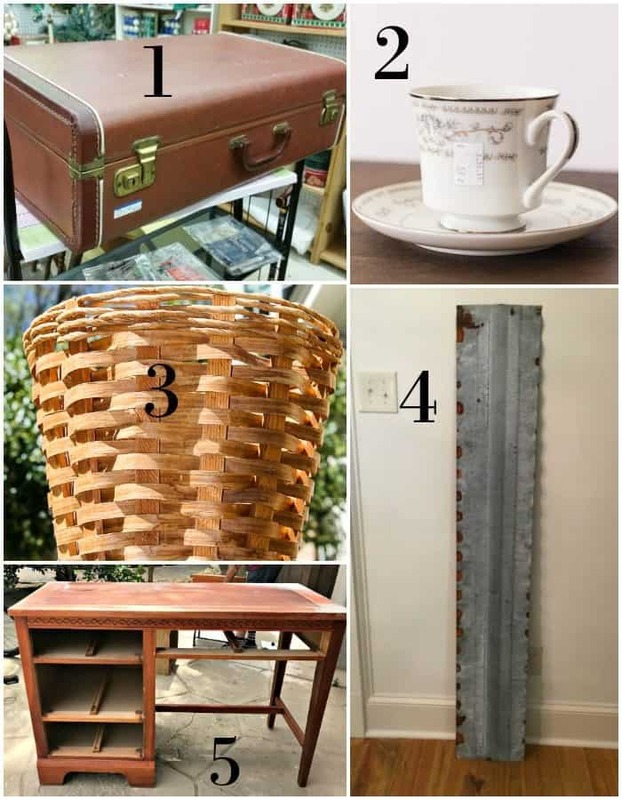 The project today is a thrift store décor makeover. Nothing makes me smile like turning an inexpensive find into something pretty. My Thrift Store Decor buddies have projects today too. The links are at the bottom of the post. Be sure and check out their makeovers. The glass container/jar/whatever was marked $2.48 but of course I got my “Being Older Is Better” discount. I didn’t care for the lettering on the container and I wasn’t feeling the aged metallic brassy classy look either. Not my style. I took a putty knife (dirty but usable) and scraped the lettering off of the glass. 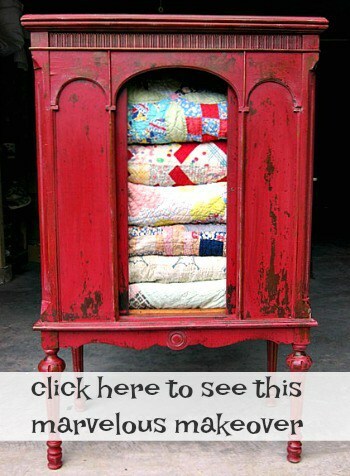 I’ve also done this with older china cabinets that have the gold detailing on the glass doors. There was a faint film where the lettering was removed, adhesive or something although it wasn’t sticky. A little scrubbing with Simple Green and it came right off. The container needed a good cleaning anyway. Next up is the spray paint. The color is Heirloom Satin. 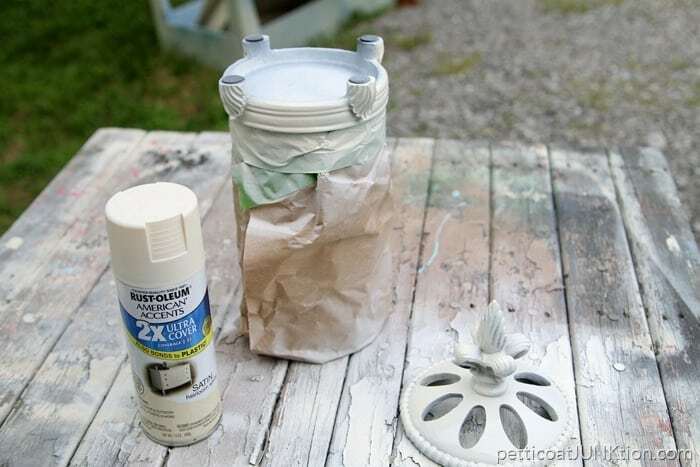 My favorite off-white from Rustoleum. I used FrogTape and brown packing paper to keep the glass free of paint. 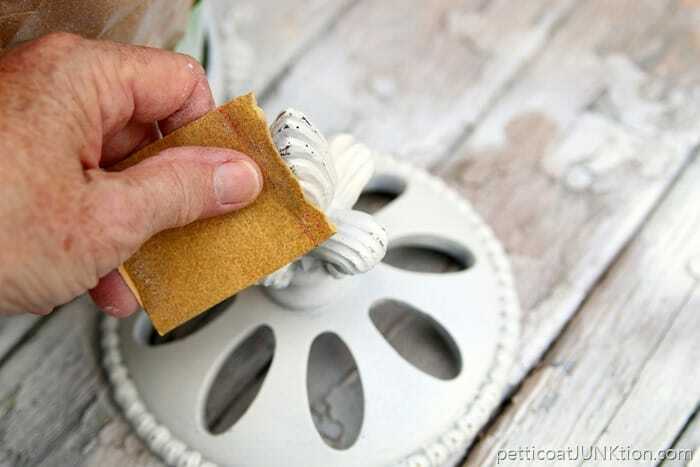 Once dry I distressed the paint with 100 grit sandpaper. 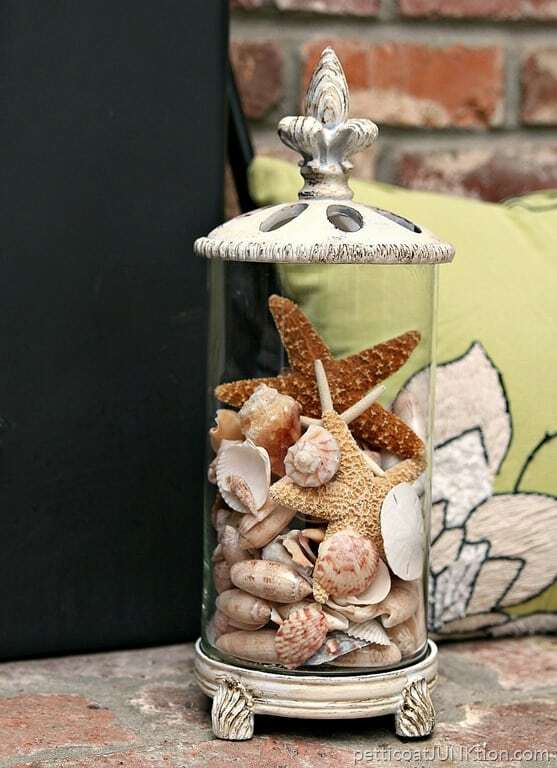 I planned to leave the paint as is but when I added seashells to the container the paint looked too white. A coat of dark wax, Howard’s Golden Oak, and the seashell filled container was perfect. I can think of all kinds of uses for the pretty container. It would look nice filled with limes, or a tall white candle, or a tiny succulent plant sitting on top of glass beads. What else could I put in my newly painted container? 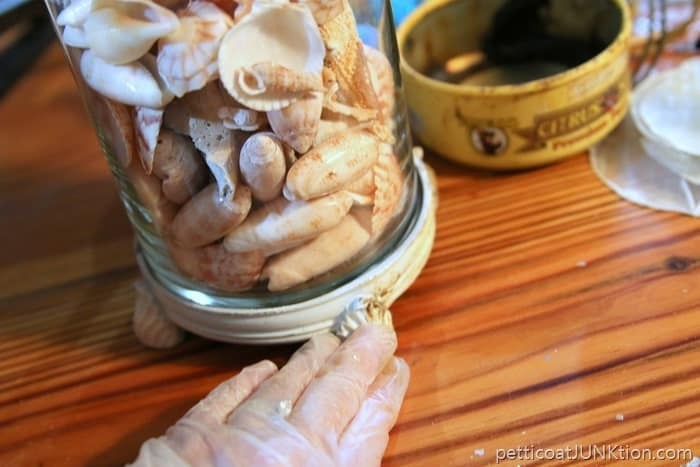 I have another cool seashell holder display thing for you to check out here….Decorate A Clay Pot. 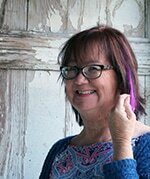 Leave me a note and visit my thrifty friends by clicking the pink text links below the photo. Don’t forget to enter the Big Craft Supply Giveaway by clicking here. See you tomorrow! This turned out really really nicely. 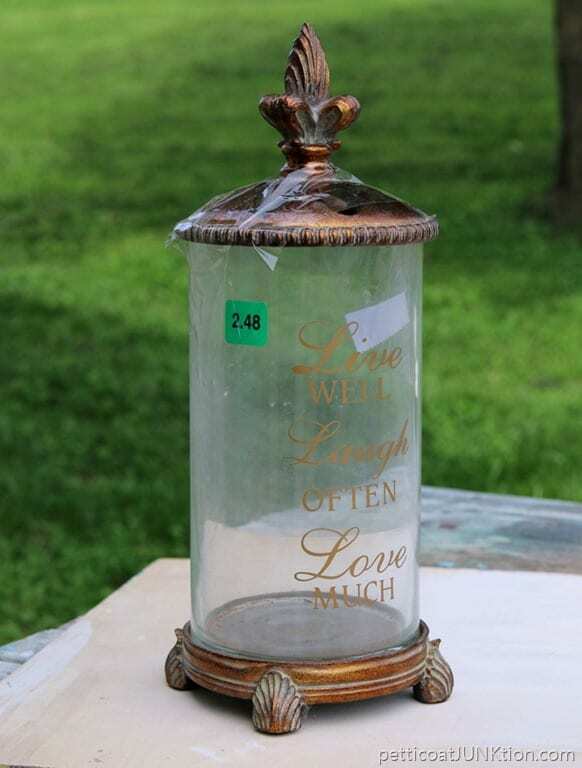 It looks like a good size jar, what a great thrift store find. Love it. That turned out gorgeous! And to think…..I would have passed that item right on by at the thrift store! My mistake! Thank you for the invitation! Hopefully I’ll remember. Love the shells! A smaller container could hold cotton balls in the bathroom. Thanks for sharing. I like it better this way. Anything will work in it as you said. Wow, that jar turned out great! What a find! Can you put chocolate in that before I stop over? You come over Bliss and there will definitely be chocolate in it and hot coffee in the pot. What a very cool find and a great make-over! I think you could put lots of things in it, but I love it with the shells which are one of my favorite things anyway. Thanks for the tutorial! And for sharing your glass-cleaning method. So pretty! You know I love any shell display! Wow! That turned out to be so pretty. Major improvement minus the lettering. Love it with the shells! 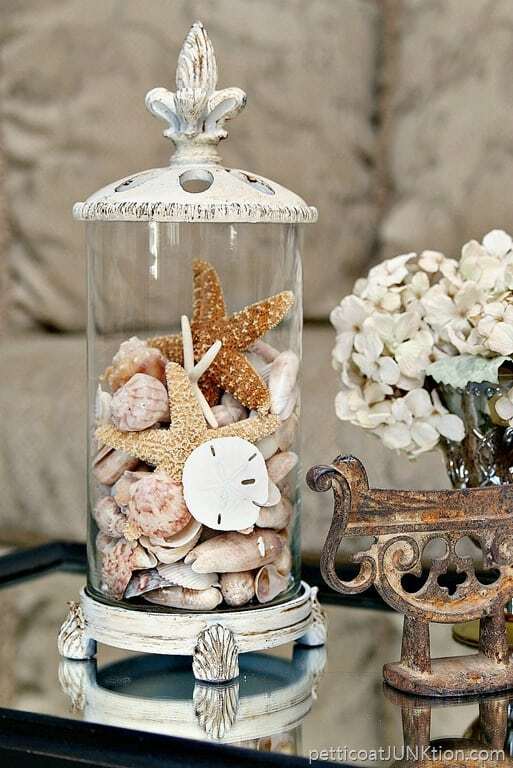 This turned out so pretty, love it with the beachy feel with shells! Wow, what a huge difference. Great idea and thanks for showing us how! Wow! Kathy–you had vision. That’s an amazing makeover on that thrift store container. I love the new color. This looks great, Kathy. 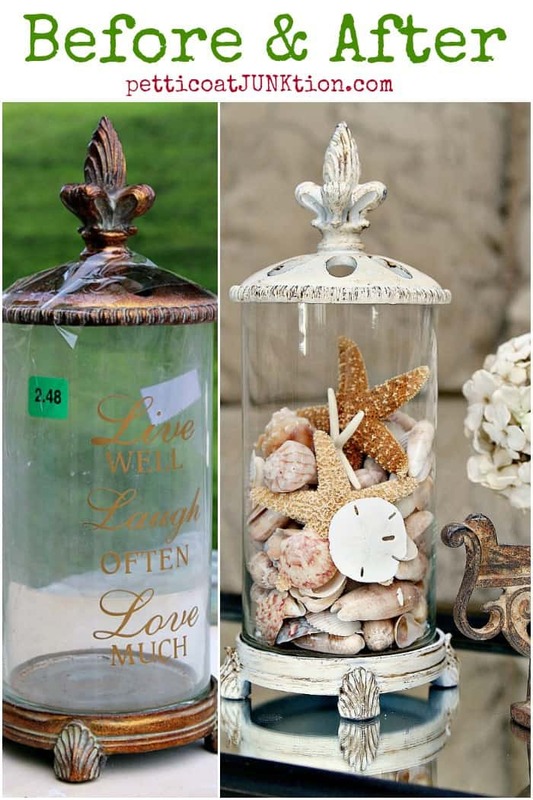 Gave me an idea for getting our seashell collection out of the plastic tub stored in the bottom of our china cabinet and on display! I like it with the shells! 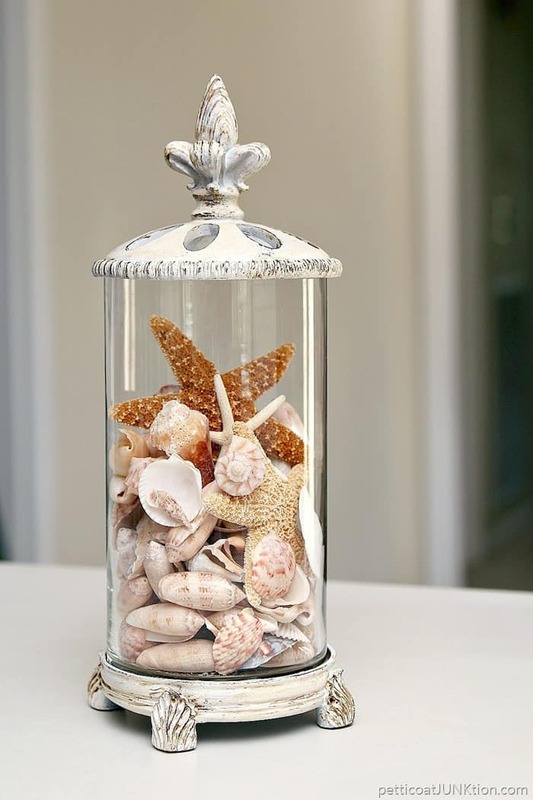 This is so pretty, I love the seashells and starfish inside!!!! I have a similar container, currently in a flat black paint, that will look beautiful refreshed like yours! Thank you for sharing!! !